Brooklyn, NY - American Idol Winner Fantasia, Voice Winner Tessanne Chin, 2 Divas, 1 Night "Voices In Concert"
Every so often with each generation, music lovers are blessed with memorable, distinguishable and haunting voices, the kind that pulls at your heart strings and leaves a lasting impression. 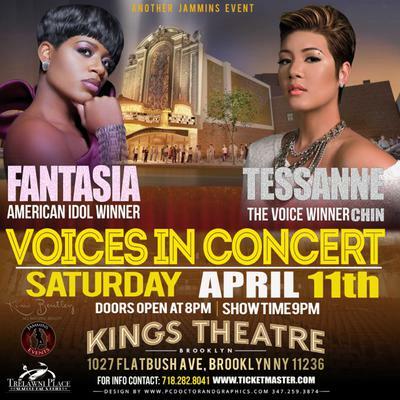 On Sunday, April 11th, 2015 Jammins Entertainment brings American Idol winner and 8 times Grammy nominee Fantasia, along acclaimed Voice Winner Tessanne Chin for "Voices In Concert". Between the 2 soulful stars are a string of hits, such as Fantasia's "I Believe", "Truth Is", "When I See U", "Ain't Going To Beg You" and "Lose To Win", and Tessanne Chin's "I Have Nothing", "Hide Away", "Count On My Love", "Tumbling Down" and "Everything Reminds Me Of You"
2 Divas, 1 Stage, 1 Unforgettable Night! Get your tickets early as this unprecedented event will only take place for one night. "Voices In Concert" at KINGS THEATRE in Brooklyn, New York.